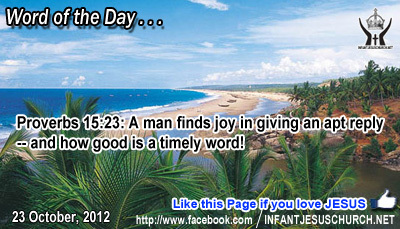 Proverbs 15:23: A man finds joy in giving an apt reply -- and how good is a timely word! Heavenly Father, we will spend much of our time today with people. Some of them know you, but most f them do not. Please give us wisdom to say things that lead people closer to you. Give us words of help and hope for the broken. Give us words of tenderness for the fainting. Give us words of direction for the confused. Heavenly Father, we pray that whatever words we do say today may reflect your will and may be led by your purposes to bless others. In Infant Jesus' name we pray. Amen. God loves faithfulness. Faithfulness demands regularity, a willpower to stay the course and see the task to its conclusion. That is why we can always anticipate God to give us what he promises. In turn, God looks forward to be faithful to him and to one another. How can we grow in faithfulness? God's grace shows us the way. When we are faithful in the little tasks and promises we make, we learn to be faithful in the better and more important responsibilities and tasks entrusted to us. Our return is the Jesus himself who shares with us his joy and friendship – “well done good and faithful servant enter into the joy of your Master” (quoted). Loving Infant Jesus, you are faithful even when we fail. Help us to persevere in faithfulness and not shrink back in the face of challenges or difficulties. May we never forget your presence with us and may we always be ready to receive you when you call us to your home.